A combination of a long hot summer and school holidays are generally never the ideal conditions for a buoyant property market, as it’s the ideal opportunity to chill, explore and enjoy some family time. Couple that to the continuing distraction around the Brexit negotiations, the squeeze on the High Street and some gloomy corporate results, you could be forgiven for expecting the property market over July and August to have been quite dire. On the contrary, our research shows that it was actually relatively stable for residential sales in our region. Pretty much the whole area we cover, as shown on the map, is in demand. 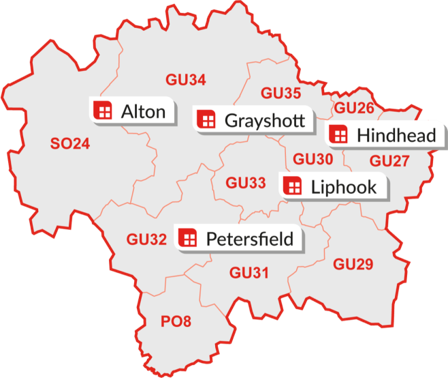 Buyers, both locally and from outside the region can see the great value here, compared to areas north of us such as the M4 corridor, Guildford, Woking and the Surrey Hills. They also benefit from the glorious countryside, in and around the South Downs National Park and, of course, the excellent road and rail links. From our own research using Homes data, plus Rightmove Intel and Dataloft sources, it shows that the total number of sales across the region in the summer holiday period, through all estate agents, was fairly level with last year at just over 300 sales agreed covering all residential properties. Homes Estate Agents maintained its position as the area’s leading agent, with just over 20% share of this market – an achievement we’re clearly very pleased about! Although overall sale prices in the area were fairly flat too, this is actually quite encouraging under the circumstances. As reported on a number of occasions this year, a disproportionate number of properties were being offered at unrealistic asking prices this year but where vendors have made the necessary adjustment, they have found willing buyers. That said, in our experience, whilst transaction volumes are on par, it’s been quite a bit harder to put the deals together and we expect this to continue for the foreseeable while. Some very interesting Land Registry data, obtained through Dataloft®, analysing the specific performance of our local postcode region compared to the South East and the National picture, underlines just how resilient our area is, in terms of transactions. On the table, you’ll see that our local region is up slightly year on year, whereas the rest of the market is down and, whilst we are slightly below on prices, its much better for a healthy market to have the increased activity.